The way eggs are produced in this country has changed dramatically since World War II with the introduction of industrial-style barns. But a few farmers still prefer to use more traditional methods. Ranch Foods Direct customers can’t seem to get enough of farm fresh eggs that come from free-ranging hens. One unmistakable difference is the yolk: it’s pert and bright orangy-yellow, a result of natural diets. Marcy Nameth and her boys (that’s David, pictured) raise chickens at Greenhorn Acres and now supply eggs to Ranch Foods Direct. By using an “egg-mobile” with fencing to ward off predators, they can rotate the hens from one patch of forage to another in their farm fields along the Arkansas River. At any given time the hens could be feeding on lush barley, oats, grass or even wheat sprouted on the kitchen window sill in winter, Marcy says. Eggs are already considered the most complete form of protein but producing them on fresh greens “increases the Omega 3s and the CLA,” two unsaturated fatty acids known for their health benefits, Marcy says. Although CLA is most recognized for its anti-cancer properties, researchers have also found that it can reduce the risk for cardiovascular disease and help fight inflammation. CLA is also known for its body weight management properties, which include reducing body fat and increasing lean muscle mass. Another benefit of the egg mobile: better quality of life for the hens, which improves their longevity. “Chickens are capable of laying for 20 years if fed correctly,” she says. In the display case, these eggs join those from Echo’s Eggs, produced by high school junior Echo Jones, below, who keeps the birds in a free range environment on her family’s multi-generational farm along with ducks, geese, goats and pigs, as well as Wisdom Natural Poultry of Colorado, which supplies eggs, whole chickens and seasonal turkeys. 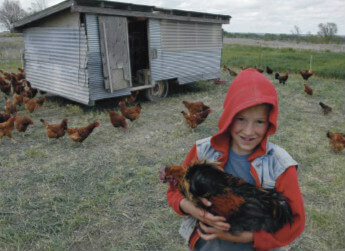 • About 95 percent of the eggs produced in the U.S. come from large egg farms housing millions of hens under one roof. • Prior to World War II, most egg production came from farm flocks of less than 400 hens. By the early 1960s, technological innovations caused that to shift. • There are currently about 245 egg companies with flocks of 75,000 or more. Of these 245 companies, 60 have at least one million laying hens, and 12 have more than 5 million hens.